One single enterprise technology solution that provides common business functionality across an entire organization has been the goal of many CIOs for years, as they strive to reduce costs, streamline and standardize their services and architecture, and maintain portfolio consistency. Nowhere is this truer than with Business Process Management (BPM), Content Services, and Data & Process Analytics systems. After all, why would you want to have multiple solutions for controlling and managing your organization’s critical data and business processes? If you are already handling all those vital processes and data in a reliable, consistent manner, transitioning to one single enterprise technology solutions sounds like an achievable goal, right? The truth is, even when isolating functional areas, the goal to have one large system that provides all capabilities across your enterprise is unrealistic. There are too many competitive systems out there and most organizations use more than one. Moving and consolidating your systems into one single system is costly and time-consuming, especially when you still have day-to-day business operations to manage. Trying to also manage, and successfully complete, platform upgrades can become a large undertaking with risky and costly challenges. Today’s technology world is complex and ever-changing, so for you to maintain a competitive advantage and achieve your strategic and financial goals, greater thought and foresight are required to ensure that you make the correct technological decisions for your organization. Take Content Services, for example. 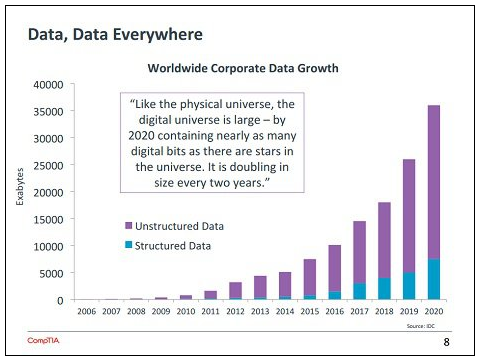 Just looking at the projected growth of unstructured data alone presents significant hurdles. However, even with the existing complexities, the idea of having a consistent architecture and standardized tools that provide robust services across an organization’s portfolio is achievable with a defined, implemented, and governed strategy. Without a strategy, the odds of success fall dramatically. On average about large IT projects run 45% over budget and deliver over 50% less value (source: PMAlliance). The odds are challenging enough but if there is no clear direction defined with goals and key objectives to measure success against, enterprise technology initiatives are likely destined to fail to achieve the expected benefits or just fail completely. A comprehensive, robust strategy comprises several factors and key focal points that enable agility and flexibility in an organization while providing cost-effective and reliable core services to support business needs. By defining and following a comprehensive strategy, you can successfully implement and maintain enterprise solutions while achieving higher ROI and better business solutions that meet your organization’s current as well as future goals. Next Article » Top Three Digital Transformation Misconceptions…Beware!